Click here for a list of required supplies and recommended accessories. Hedgehogs require a minimum of 3-4 square feet of floor space. The cage must also have a flat (not wire) bottom and adequate ventilation. More space than the minimum can be a good choice, but "bigger is better" does NOT apply in all cases. Enclosures that are considerably larger than the minimum size requirement come with some drawbacks as well. In addition to being more difficult to heat, oversized cages can be intimidating to hedgehogs, because they feel more secure when they have more cover. Most hedgehogs are most comfortable if between 2/3 and 3/4 of the floor space if filled with "stuff". In addition to the mandatory items (wheel and litter tray, hideaway, bowls), additional space can be used for multiple hideaways of different kinds, tunnels and PVC pipes, fleece strips, blankets, and various hedgehog-friendly toys or pieces of "furniture". If a cage only has the bare necessities in it, the typical hedgehog will be happier in a large bin (approx. 3.5 square feet) with not much open space left over, rather than in a 2x3 C&C cage (approx. 8 square feet) with a large amount of open space. Hedgehogs can be very good climbers, but only when they're going up. Falls from climbing can easily result in broken legs or other serious injuries, so climbing should be prevented. Cages with wire sides may have to be modified with coroplast (corrugated plastic/sign board) or something similar to create 8-12" of flat walls. Cages without ramps or second levels are best. Some hedgehogs will do fine with shallow ramps and additional levels that are fairly low to the ground, whereas taller cages designed for ferrets aren't a good option. Ramps and lofts may need to be modified to keep them enclosed, if necessary to keep the hedgehog from falling. Some of the popular cage choices are large, clear Sterilite bins (105 quart or bigger), C&C cages, flat-bottomed small animal cages (18"x30" or bigger), Ferret Nation or Critter Nation cages, and modified vivariums. Tanks and aquariums should not be used because they are designed to keep in moisture and do not provide adequate ventilation, which can lead to respiratory problems. Hedgehogs are solitary animals by nature, and should generally not be housed together. There are exceptions, such as mother/daughter or female siblings that are bonded - but a new hedgehog should not be put into another hedgehog's cage with the assumption that they will get along. A hedgehog's cage must be kept between 72 and 80 degrees Fahrenheit. For most hedgehogs the optimal temperature is 74-76, although an individual hedgehog may prefer it a little warmer or cooler than that. Temperatures lower than 70 degrees are considered "cold" for hedgehogs and can result in a hibernation attempt, which can be fatal. A sudden drop in temperature, even if it doesn't get below 70 degrees, can still trigger a hibernation attempt or cause other health problems. The cage should be kept out of drafts for the same reason. If the cage gets above 80 degrees, they may show signs of being too hot, such as "splatting" with their stomach to the floor and legs splayed out. In the summer, a ceramic plant pot or floor tile within the cage will give them a way to cool down. Hedgehogs can tolerate temperatures up to about 90 degrees, but it is not comfortable for them and should be avoided if possible. Even if a room or house is kept in the correct range according to a thermostat, a thermometer MUST be in the cage itself to keep track of the temperature. Cages kept on the floor will be as much as 5-6 degrees cooler than the air higher up in a room. Central heating, space heaters, and ceramic heat emitters (CHEs) are the most common choices for heating the cage. Small animal heating pads can be used as supplemental heating (best kept for sick or elderly hedgehogs, not healthy adults), but they should not be the primary heating source because they do not effectively heat up the air of the cage. Reptile heating lamps are not a good choice because they emit light as well as heat, and most hedgehogs won't come out at night if there's a light source nearby. A specific lighting schedule is not strictly necessary, but most hedgehogs do best with a consistent source of light for about 12-14 hours each day. Natural light, especially during the winter, is not always adequate - it can be unreliable due to weather, and the gradual shortening of days during the autumn/winter can trigger a hibernation attempt. The easiest way to provide the light is to put a lamp near the cage, plugged into a timer. An overhead light in a room will work as well. The best choice of bedding is fabric liners. These can be as simple as a piece of fleece cut to the correct size, or they can be several layers sewn together. Fleece doesn't need to be sewn because the edges will never fray, but other fabric types (flannel, etc.) have to be sewn to prevent any loose threads that could catch on a hedgehog's feet. Liners should be spot-cleaned daily and changed 1-2 times per week, depending on how messy the hedgehog is. Wood shavings (aspen or pine) or paper-based bedding (Carefresh, Yesterday's News) are acceptable, but all of these have the same flaws. They can harbor mites, cause allergies, dry skin, and respiratory irritation, and pieces can get caught in a male hedgehog's penile sheath. Cedar shavings should NOT be used, because the oils in cedar wood can cause respiratory issues and other health problems. Commercial hedgehog foods should be avoided. Most of them are made primarily of "filler" ingredients, and some even include ingredients that are dangerous or toxic to hedgehogs (i.e. nuts/seeds, raisins). » A meat or meat meal (i.e. "chicken" or "chicken meal") as the first one or two ingredients. » 28-35% protein (30-33% is ideal). » Under 15% fat (10-12% is ideal). » Minimum "filler" ingredients (corn, corn gluten meal, etc); healthy grains are acceptable. Most adult hedgehogs will eat 1-2 tablespoons of kibble per day. Young hedgehogs (under 6 months) will sometimes eat more. The amount of food, the fat content, and activity level should all be considered as part of keeping a hedgehog a healthy weight. While some hedgehogs can do well being "free fed" (having as much food available as they want to eat), this isn't true for all of them, and some hedgehogs can become overweight if their food isn't restricted. However, 1 tablespoon is the minimum that a hedgehog requires daily, and food should never be restricted further than that. In addition to cat food, a hedgehog's diet can be supplemented with fruits and vegetables, cooked meat (unseasoned), baby food, insects, and other treats. These are recommended for variety, but they are not necessary as long as your hedgehog is eating good quality cat food. Mealworms and crickets are the most common insects fed to pet hedgehogs, and can be offered daily in addition to the staple cat food. Freeze-dried insects can sometimes cause constipation or compaction, especially in large amounts, because the freeze-drying process removes the moisture and makes them more difficult to digest. Live insects are much more nutritious as well. Keep in mind the fat content of whatever insects are offered. All insects should be bought from a pet store or similar - "wild" insects are likely to contain pesticides and other things that can be harmful to a hedgehog over time. For a list of recommended cat foods, click here. For a list of appropriate treats, click here. Hedgehogs should be handled daily to keep them well socialized and aid in the bonding process. This is necessary for them to bond with their "person". It can take a lot of time and patience to establish a relationship with your hedgehog, but once that bond is formed, it is very strong. At least 30-60 minutes should be spent with "hands on" interaction, and an additional several hours can be spent "hands off", with the hedgehog sleeping in your lap or being carried around in a carry bag. Some hedgehogs will be more interested in cuddling and some will be more interested in exploring. Both of these things count as handling. It's just as beneficial to the bonding process to have your hedgehog sleeping in your lap, as it is to have them crawling all over you. Because hedgehogs are covered in thousands of sharp quills, there is no way to avoid getting pricked and poked. A small blanket or piece of fleece can be used to pick up a hedgehog that's curled into a ball. Gloves should not be used for picking up or handling them, because gloves will smother the natural scent of you and they will not be able to get used to the feeling of your hands. Baby hedgehogs are especially prickly because their quills are new, but in adults that are handled daily, the quills become slightly blunted. Your hands also get used to the feeling, and as your hedgehog settles in and gets to know you, they will be less likely to have their quills raised. A hedgehog's underside (stomach) area is soft, with no quills. When they aren't curled into a ball, the best way to pick them up is to bring your hands in from either side (palms faced up, fingertips pointed together) in a "scooping" motion underneath the hedgehog's stomach. Keep your fingers flat - do not curl them in toward the stomach, or you risk getting them caught against the quills if the hedgehog balls up. Once you're more comfortable and confident, you can pick up your hedgehog from above by stroking your hand slightly back along the quills, so they're flat against your palm, and then lifting with your fingers gripping from either side. For a first time owner, the instinct when handling a new hedgehog is to be very tentative, holding it with hands flat and slightly away from the body. This isn't the best approach to handling a hedgehog, so you should be mindful of it and try to change your approach if you catch yourself doing that. Your hedgehog will be more relaxed if it's held in close to your body. Hedgehogs also are very perceptive - if you're nervous or cautious when you handle them, their demeanor will be similar. Confident handling is absolutely the most important part of developing a good relationship with your hedgehog. Even small things can make a big difference, like the position of your hands and the certainty of your grip. Once you get some practice, you should be able to put your hedgehog into different positions and handle them in different ways, including playing with the feet and ears, turning them on their back, and so on. "Manhandling" as part of the day to day interaction teaches your hedgehog that you're in control and confident, and they will trust you that much more. Especially in the first few weeks, while they're getting used to new people and a new environment, hedgehogs will be cautious and show some defensive instincts, like lowering the forehead ("visor") quills, huffing, or possibly curling into a ball. With continuous handling, these will lessen over time, although some hedgehogs will always have those behaviors to a small extent, just as an innate part of being a prey species. The most important thing when your hedgehog displays defensive behaviors is to ignore it, and continue handling regardless. If you take your hedgehog out for handling, commit to at least 30 minutes, regardless of how "grumpy" they might be at that moment. A hedgehog that is returned to its cage or left alone in response to huffing will simply view it as a "reward" and continue the behavior, but a hedgehog that gets no reaction when it huffs will gradually do it less. Be mindful during any kind of interaction that you don't want to give your hedgehog the impression that you're intimidated (even if you are). In general, hedgehogs will be most receptive to spending time with their "person" if consideration is given to the time of the day. Because hedgehogs are awake during the night and sleep during the day, the evening is often a good choice. A hedgehog woken up in the early afternoon is likely to be grumpy or just want to sleep, whereas a hedgehog woken up in the evening, close to when they would naturally wake up, is more likely to want to play or explore. However, it can also be very beneficial to the process of bonding and socializing to take a hedgehog out during the day, as long as they are given the option to sleep and not forced to be awake. Sleeping bags ("hedgie bags") are great for this. You do not have to wait for your hedgehog to wake up on their own before taking them out. Most hedgehogs are very adaptive, and as long as the basic cycle remains "nocturnal", they can make minor adjustments according to your schedule. A hedgehog will wake up on its own anywhere from the early evening to midnight or later, and this is triggered just as much by light as by an internal clock. You can use a light schedule to encourage them to wake up earlier in the evening, if that's what works best and allows you to maximize handling time. Hedgehogs can also be taken out of the house in carry bags or a Hedgie Hood, which exposes them to different stimuli than they would normally encounter at home. Depending on the personality of the hedgehog, they may do better with short trips or may be fine with longer ones. If an outing lasts more than several hours, they should be offered water at some point during it, but food is not necessary unless the outing interferes with their normal "awake time" during the night. Hedgehogs that are regularly taken on outings tend to be more receptive to new people, new experiences, and any changes that might be made to their home (cage, etc) or routine. Using a carry bag or Hedgie Hood around the house is great for hands-off bonding as well. The best "soap" to use is either Hedgie Soap (formulated specifically for their needs) or a gentle body wash - Aveeno, St. Ives, Dove, and similar off brands are frequently used. Unscented or mildly scented is best, and formulas made with oats/oatmeal are good for quilling or for soothing (but not fixing) dry skin. Many sources recommend baby formulas, but those designed for adult humans can work just as well, especially if you pick something specifically labeled for "sensitive skin" or "moisturizing" purposes. Avoid anything with "shampoo" in the name, including shampoos for babies or cats/dogs - these products are designed to remove natural oils from the skin and fur/hair, and in general are more harsh compared to body washes. To bathe your hedgehog, fill a sink or bathtub with several inches of warm water. It should feel a little bit warm when tested against the inside of your wrist - not cold, and also not too hot. If the bath takes more than a few minutes, you should monitor the water and drain it when the heat is gone, then refill it with warm water again. About a dime-sized dollop of the body wash is enough. Lather it onto your hands and then stroke your hands along your hedgehog's back (in the direction of the quills, not against them) and stomach. Another option is to add the bath wash directly to the water to make suds, and scoop these up to rub onto their back and stomach. A toothbrush can also be used to lightly scrub at the quills if necessary. Make sure the water coming out of the faucet is the right temperature before rinsing the soap off. Be careful to avoid getting water in the ears or nose. After the bath, they should be cuddled in a small towel or a blanket until they're dry. It's a good idea to have several available and to switch them to a dry one after the previous blanket/towel becomes damp. Make sure your hedgehog is completely dry before going back into the cage - a damp hedgehog can easily catch a chill, which can cause a URI or a hibernation attempt. Hedgehogs generally don't need to be bathed more often than every other week, although it depends on how messy the individual is. Some can go 1-2 months without needing to be bathed, and others will need a weekly bath or they'll start to smell funky. Babies are especially prone to being messy, and may require more frequent baths. Starting with a bath about once a week for the first month or two can be beneficial because it provides practice, allowing both the hedgehog and owner to become comfortable with that routine. Frequent baths can exacerbate any dry skin that's already present, or occasionally cause it if the air is already very dry (because of location or time of the year). Normal dry skin remedies (covered below under "Hedgehog Ailments") can be used every few days or after each bath to prevent dry skin. Therefore, there is no reason to not give a hedgehog a bath whenever they need it. Some hedgehogs will enjoy baths and have fun swimming, but for others it's a stressful and unpleasant experience. Regular bathing (about once a week) will help your hedgehog get used to it, so it's less stressful, whereas if you put off bathing for as long as possible, it will be more of a "big deal". A bath is also the perfect time to check your hedgehog's nails and clip any that are getting long. Foot baths can be given daily, and most hedgehogs need them at least a few times a week. A foot bath involves very shallow warm water in the sink or a medium-sized tupperware container. Any poop on the feet (which is common) will be loosened from the water as the hedgehog walks around, and you can use a toothbrush for any stubborn bits. A damp paper towel or a baby wipe can also be used to clean the feet. A hedgehog needs some time outside of the cage every day. They are very curious and often will love to explore. A small hedgehog-safe room or a large playpen can give them a chance to explore and play, and various toys or other objects on the floor can make things more interesting. Some hedgehogs will never be very interested in playing with toys, but making them available still serves as a kind of enrichment. Some toys that are the most popular with hedgehogs are toilet paper tubes, cat balls (solid-sided to avoid mouth injury), toy cars (Hot Wheels/Matchbox or similar), fabric or plastic tunnels/tubes, rubber toys (small squeaky toys, rubber ducks, etc), small stuffed animals (preferably without loose threads like yarn hair), and cardboard boxes. Medicine bottles or similar containers can be filled with rice to make a rattling sound when they're pushed around. A dig box filled with strips of fleece will provide an outlet for their digging and burrowing instincts, and most hedgehogs are happy to burrow inside an old shirt or blanket. Hiding treats or mealworms in a dig box or in a bowl of smooth aquarium stones (large enough to not fit in a hedgehog's mouth) will let them forage, similar to how hedgehogs forage for food in the wild. The one "toy" that absolutely must be made available is the wheel. Exercise is essential for the health and happiness of a hedgehog. In the wild, hedgehogs can travel upward of 5-10 miles every night while foraging for food, and it is impossible for them to get this kind of exercise just from being handled and played with every day. For that reason, a hedgehog MUST have a wheel. Contrary to some regional sources and unverified claims, there is no age requirement for a hedgehog to start using a wheel. If the hedgehog is old enough to be in a new home, it is old enough for a wheel. Any purported "risk" from providing a wheel prior to a certain age (12 weeks is most often referenced) is a myth, and adhering to such a requirement can have a detrimental effect. A short period without a wheel is not ideal but will also not cause any serious issues if the situation requires it - for instance, if there is a wait time when ordering from an online source, or if a hedgehog is kept in a carrier overnight while traveling - but the wheel should be considered a necessity. It is not an optional accessory, and should not be withheld for an extended period except for reasons related to a hedgehog's health. For instance, a foot/leg injury or recent surgery may require removal of the wheel for a certain amount of time (depending on the exact nature of the ailment) in order to allow for healing. Whether or not they use the wheel all the time, or right away, is variable - babies sleep a lot, transition can reduce activity levels, and sometimes a hedgehog will just take a day off for no particular reason. The important thing is that the wheel needs to be available. The wheel should have a solid running surface, to prevent injury to the hedgehog's delicate feet. Wire wheels (with metal bars/rungs or mesh/grate) should not be used for any reason. Some solid wheels have griooves or ridges, which are not ideal because they are rougher on a hedgehog's feet. A completely smooth surface is preferred, and will not cause any difficulties with traction. This type is also much easier to clean, and for most hedgehogs, the wheel has to be cleaned daily. The appropriate size of a wheel for an adult hedgehog is 11-12 inches, with a running surface at least 4 inches wide. Wheels made from buckets ("bucket wheels") are an excellent choice for hedgehogs. They are quieter, easier to clean, more sturdy, and overall much better quality than store-bought wheels. Bucket wheels are not available from pet stores or other major commercial sources, but there are several popular online sellers. Because they are a handmade item sold by small businesses, and need to be shipped (unless you're lucky enough to have a local source), they cost more initially, but with correct maintenance they will outlast a hedgehog's entire lifespan. The smallest appropriate bucket wheel is made from a translucent pail (3.5 gallons). It is 10.5" in diameter with a 5" running width. (This is the only exception to the 11" requirement.) Because of the extra width, these can work well for more petite or stocky hedgehogs - however, they are not quite big enough for adult hedgehogs that lean toward the longer or heavier end of the spectrum, so sometimes if a baby or juvenile starts with this wheel type they will require an upgrade later on. The plastic of this type is somewhat thinner and more pliable, and more likely to lose its shape when used by a heavier hedgehog. Because the specific pail used has sloped sides, the resulting wheel has a slightly angled running surface, and the diameter at the back of the wheel is roughly 9.5". The most ideal bucket wheel is made from an opaque bucket (5 gallons). It is 11" in diameter with a 5" running width. Although the difference between 10.5" and 11" may not seem significant, because of the previously mentioned details about the 10.5" bucket wheel (the slope, smaller diameter at the back wall, and thinner plastic), the 11" size is actually a substantial upgrade. It is appropriate for even the largest and heaviest of hedgehogs, and can be confidently purchased for a baby without any possibility of needing to buy another, larger wheel when the hedgehog reaches adulthood. If a wheel is not literally made from a bucket that is cut down to the correct size, it is not a "bucket wheel". In addition to true bucket wheels, other handmade wheel types are made from cake toppers or poultry feed dishes. Cake cover wheels are larger than bucket wheels and a great option - however, they are not currently available from major wheel sellers due to widespread issues with the previous primary supplier. Wheels made from poultry dishes (sometimes called "express wheels") are smaller than bucket wheels in both diameter and running width, and although they are sometimes sold alongside bucket wheels (at a lower price because they do not have to be cut down), they do NOT meet the minimum size requirements for any adult hedgehog. The only store-bought wheels currently considered safe for hedgehogs are the Comfort Wheel and the Flying Saucer wheel (12" size). Both of these have some drawbacks, namely when it comes to noise, ease of cleaning, and general quality. They are easier to find, and cheaper, but with average use both of these wheels tend to break down within as little as six months, and a yearly replacement is typical. Hedgehogs are primarily nocturnal animals, so they are most active at night. Therefore, this is the best time for handling and interaction. Hedgehogs come with all different personalities. Some hedgehogs can be very sweet and cuddly, but almost all hedgehogs have at least a little bit of natural "grumpiness". Your hedgehog might not be very interested in being held or cuddled at certain times (or ever). Some hedgehogs would much rather explore or burrow under blankets, than snuggle or be held. Because hedgehogs are solitary by nature, they may never actively seek out their "person" for companionship or attention. Balling up is a hedgehog's natural defense against predators in the wild - it makes them into an impenetrable ball of sharp quills. Domestic hedgehogs will curl into a ball in reaction to a perceived threat, and this can be common when you first bring your hedgehog home, until they get used to you. Some hedgehogs will always ball up when they're first woken or picked up. This isn't a sign of an unfriendly hedgehog, but just a reflex reaction. Similarly, some hedgehogs will always lower their forehead quills ("visor") when startled, especially if something comes suddenly from above or toward their face when they're not prepared. Hedgehogs can be skittish when exposed to loud sounds or areas with a lot of activity. It can benefit the hedgehog to expose them to these kinds of situations and stimuli (similar to socializing a puppy). Use your best judgment when it comes to location of the cage, and be careful not to "shelter" them from the regular noises of the household. A spot that gets foot traffic throughout the day is ideal, or if their cage is located out of the way, it can be beneficial to have a small radio nearby to provide some noise for at least several hours a day. Hedgehogs are quiet animals in general, but they make a variety of different noises that convey different meanings. Huffing is a normal reaction to being picked up, hearing the door close, or encountering a new smell. Intense repeated huffing is a defensive sound intended to be "scary". Popping, clicking, and hissing are all signs of agitation. Chirping means the hedgehog is happy or especially interested in something. Snuffling is a common sound while a hedgehog is exploring or encountering something new, including a new smell. Purring is a sign of contentment. "Quilling" is when a hedgehog sheds old quills and grows in new ones. It's something that all young hedgehogs go through. An adult hedgehog has thousands of quills, and during quilling, it's not unusual for 30-50 or more to be shed every day. Most hedgehogs will have a period of quilling around 6, 9, and 12 weeks - however, these ages are only approximate, and the actual quilling periods can vary quite a bit. Some hedgehogs will continue quilling for a while past 12 weeks, and some will essentially be quilling the entire time from 6 through 12+ weeks. Some hedgehogs can also have a small quilling period at 6 months and/or a year old. The quilling that occurs around 9 weeks of age is usually the most dramatic, and can result in a drastic change in color and appearance. For this reason, a hedgehog's adult color cannot be determined until after 9 weeks. Quilling is very uncomfortable because it involves many sharp quills pressing up through the skin. As a result, hedgehogs can be very grumpy during this time, and also very sensitive about having their quills touched. Quilling can turn the sweetest of hedgehogs into a huffy, disgruntled ball of spikes, and this can last for weeks. It's important not to be discouraged during this time, and not to think that it means the hedgehog "hates" you. The best thing to do for a quilling hedgehog is to be patient and gentle, but not walk on eggshells. Keep contact with their back to a minimum, but continue to handle and socialize them every day. A hedgehog that is very grumpy from quilling can be quick to huff and pop at any little thing, including noises, but they should still be exposed to regular household sounds and activities, not "sheltered". Oatmeal baths can be given frequently during this time, to soothe the discomfort of quilling and to soften the skin, which temporarily reduces the pain of the quills coming in. By the time the quilling is over and the grumpiness goes away, your hedgehog's demeanor will improve, and they will have had all that time to get used to you and start the bonding process. "Anointing" (also called "self-anointing") is a very strange hedgehog behavior. It involves licking or mouthing something and working up a foamy lather of spit in their mouth. Then they twist around and contort their body, mouth open and tongue stretched out, to spread the saliva on their quills. Hedgehogs can become so fixated when they're in the middle of anointing that they seem unaware of what's around them or even fall over sideways during it. It's a perfectly normal and common behavior, but it can be unnerving for a new hedgehog owner who doesn't know what it is. Anointing can be done in reaction to just about anything. It's caused by a smell (possibly also taste) that is new and interesting, particularly strong, or just something they like. It's most likely a kind of instinctual defense mechanism. The frothy saliva is meant to take on the scent of whatever it's mixed with, and it's put on the quills as camouflage to disguise the hedgehog's natural scent in order to confuse or deceive predators. New foods can easily trigger this response, but hedgehogs will also anoint with a person's hand or clothes, toys, various objects, and even other hedgehogs. When anointing is caused by something that can be chewed up, the lather of spit will include clumps of it or take on the color, which is then deposited onto the quills and can be messy. This is usually food, but also can be done with things like paper towel, cat litter, or clumps of lint from anointing with fabric. Hedgehogs are not "bitey" animals by any means. Like any animal that has teeth, they are capable of biting, but it is very unusual to see any sort of repeated biting behavior from a hedgehog that has been well socialized and correctly handled. Aggressive biting habits are most common in hedgehogs that have come from a background of fear, neglect, or even abuse, such as in rescue hedgehogs that are so under-socialized and unused to being handled that they resort to biting as an exaggerated defensive method. Although not generally prone to developing a biting habit or doing it out of aggression, hedgehogs are very scent-oriented and will often use their mouths to engage with objects (including a person's hands) that they find to have an especially interesting scent. This is related to the "anointing" behavior (described above) and is preceded by licking or an intense, fixated sniffing at a certain spot. There is a vast difference between "biting" and "nibbling" in hedgehogs; the latter is a normal, harmless behavior, whereas the former would be considered a "problem behavior". Understanding the difference is essential to dealing with unwanted nibbling or biting, and taking measures to anticipate and prevent it. Baby hedgehogs tend to show the "mouthy" behavior the most, as part of interacting with and exploring the many new things in their environment. As they get older, and get used to the various scents associated with their new owner and new home, they begin to grow out of it. This nibbling behavior is relatively harmless - they are not capable of doing much damage to clothes or other objects, and because babies' teeth aren't grown in all the way, being nibbled on the hand is more surprising than it is painful. Because this is essentially an accident, it happens quickly and the hedgehog releases almost immediately, rather than clenching down and holding on. Some sources would recommend switching to a new hand soap or lotion to try to find one that doesn't get a reaction from the hedgehog, but this is not the best approach. It does not address the novelty factor, which is almost always the source of nibbling. The hedgehog is reacting to the "newness" of a scent, not the particular scent itself, so changing soap or lotion repeatedly will just introduce new scents and cause the nibbling response all over again. A much better approach is to simply give the hedgehog time to get used to whatever scents are normal for their new "person"; they will eventually lose interest, and until then, nibbling can be avoided by anticipating it and distracting them when necessary. While the nibbling phase that babies go through is harmless, reacting incorrectly to being nibbled can sometimes reenforce the behavior and lead to the development of an intentional biting habit where one previously didn't exist. Nibbling can be avoided by paying attention to the hedgehog's body language, and distracting them or moving them around when they begin to fixate on a person's hands. If nibbling does occur, it's best to react as little as possible. A strong reaction, such as jerking/flinching or making a vocal response (such as, "Ow! "), when repeated several times, can begin to teach the hedgehog that nipping will get a reaction. It's especially important to continue normal handling after being nipped, and not return the hedgehog to its cage, which will reenforce the behavior further. Aggressive, intentional biting can be done repeatedly, does not have sniffing or licking as a warning, and lasts longer. Sometimes they will let go on their own after a few seconds, and it's best to try to wait it out. If the hedgehog is determined to hold on, some sources suggest to disengage a bite by flicking the nose or blowing air in the face; this actually is more likely to make the hedgehog clench down harder. The best way to get a biting hedgehog to let go is to dribble a little water in the face - not a full stream from a faucet, but just enough to distract them, making them splutter and let go. A secondary way that owners can unintentionally "teach" their hedgehog to bite is by the careless use of treats/food as a bonding mechanism. Offering treats may seem like a good way to get a hedgehog to like a person, especially if they're in the overly defensive transition phase during the first few weeks. However, offering treats by hand can teach a hedgehog to associate the hands with food, and they may bite as a way to demand it. Consistently offering treats when first taking the hedgehog out can have the same effect. When giving a hedgehog treats outside of the cage, it's best to provide them in a bowl or to use some kind of utensil (i.e. a spoon, chopsticks, or tweezers for the case of feeder insects); this will avoid developing an unwanted association between the person's hands and food. Less often, a normally well-mannered hedgehog may bite seemingly "out of nowhere". In these cases it is a stress/fear reaction to a specific trigger, and is not habitual or aggressive. It is typically isolated, and any repeated instances will be linked to the same kind of event or unwanted stimuli. For example, a particular hedgehog might bite after accidentally being dropped, being incorrectly handled, being passed around to unfamiliar people, or to getting water in the face during a bath. 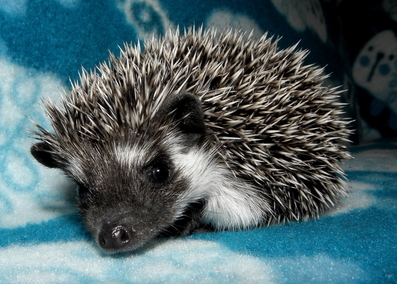 If a pattern of biting arises in response to specific situations or occurrences, it's best to anticipate it and, if it ever happens again, proceed in a way that limits the person's skin exposure (especially keeping the fingers away from the hedgehog's face) and, if possible, breaks the experience up into shorter periods to reduce the stress. For example, with a hedgehog that only bites when having its nails trimmed, it may be of benefit to cut only a few nails at a time with breaks in between, distract them with treats, or discreetly trim the nails during normal daily handling rather than making it into a specific "session". The vast majority of "biting" is either a case of nibbling that is misunderstood, or a habit that has developed from the owner reacting in a way that inadvertently teaches the hedgehog to continue the behavior. Once a true, intentional biting habit develops, it can be difficult to break, but it's very easy to avoid such a habit developing by simply being mindful of the hedgehog's body language and reacting appropriately. When a well socialized hedgehog develops a recurring, intentional biting habit, it often is related to a younger owner (child) doing most of the handling. In general, it's best for children to be secondary caretakers, with a parent or adult as the primary; it is much more common for a child to misinterpret a hedgehog's body language (including the difference between "nibbling" versus "biting"), or to react or handle the hedgehog in such a way that reenforces negative behaviors without realizing what they are doing. With the guidance of a parent or adult, children can have those things explained and have any incorrect reactions corrected. While some hedgehogs can be "trained" to use a litter tray in their cage, they don't know how to "hold it" - if they're in your hands or your lap when they feel the urge, you'll get pooped on. This is an inevitable part of owning a hedgehog. Baby hedgehogs, like any baby animal, are essentially "poop machines" because they're growing so much, and eating a lot to support that growth. Babies also don't always catch on to using a litter tray right away. They tend to be messier and need more frequent cage cleanings, but the frequency of the poop and the amount will decrease as they get older and their growth slows down. Hedgehogs poop and pee as they run, so the wheel will get messy and usually has to be cleaned every day. Their feet will also get poop on them from running through it, and they can be cleaned off with a foot bath in shallow water. A damp paper towel or baby wipe will also work. Litter training, for hedgehogs, isn't really "training" the way you would train a dog or cat. Depending on the hedgehog, they're not always going to do their business in the right spot every single time, but in most cases, they'll use the tray at least 80-90% of the time. Because they are a prey species, they have an instinct to not poop or pee where they sleep, so it works best to position the sleeping spot or hideaway at the opposite side of the cage from where the litter tray is. It's also a good idea to use a tray large enough for the wheel to sit inside of it, so the tray will catch the run-off from the wheel. Clumping, clay-based cat litter should be avoided - instead, use a paper-based litter like Yesterday's News or Carefresh, or small fleece liners, which can be washed and reused. Most hedgehogs will do the majority of their "business" in the first 30 minutes or so after waking - however, just because they poop once doesn't mean it's done. The best way to reduce the likelihood of getting pooped on is to let your hedgehog have time after waking up to move around inside the cage, until they seem to have gotten it out of their system. You can also put them in warm, shallow water (about 1/2" deep) right away when you take them out. In addition to cleaning the poop off of their feet, the water against their underside will stimulate them to poop and pee. For an adult, they typically will be poop-free for several hours afterward. It's still recommended to always have some tissues or paper towels nearby when interacting with your hedgehog outside of the cage. When a hedgehog undergoes any kind of stress, it can be apparent from the poop - it can be loose, squishy, and not well formed. It can also be tinged greenish-brown, or sometimes you'll see a semi-dark, bright green color. This can be immediate, obvious stress, such as being overwhelmed by being handled by a new person, or it can be more subtle, like the stress of getting used to a new home. The discomfort of quilling can result in inconsistent poops as well. Most baby hedgehogs will have soft or greenish poops on and off when they first go to a new home, which goes away on its own after a few weeks. Anything that upsets the digestive system will result in loose poops as well. This includes food transitions, the use of antibiotics, and unspecific minor stomach upset. Using a probiotic (Benebac or acidopholus) can be very beneficial in these cases. In powder form, a pinch can be sprinkled on top of the food - it has no taste, and is rarely noticed. It can be used daily when needed to help digestive issues, and it's also a good idea to add a little probiotic to the food regularly (once or twice a week), just to help keep the digestive system running smoothly. Benebac is a probiotic specifically designed for animals, which is available in pet stores or from a vet's office. (Benebac comes in a powder and a gel, but the gel often doesn't appeal to hedgehogs - go with the powder.) Acidopholus is available in the dietary/supplement section of any grocery store or pharmacy. It comes in capsules (pills) which can be broken open and have a powder inside. Very runny, water, "diarrhea" poop is a reason to see a vet. Diarrhea can quickly result in dehydration. While you work with your vet to identify the underlying cause, make sure your hedgehog gets plenty of fluids. Pedialyte (the clear/uncolored version) can be fed by syringe. A little mucous in the poop once in a while isn't a cause for concern - sometimes a hedgehog's digestive system will just be a little "off" and it goes away on its own. Recurring, frequent mucous, or any blood or red-tinged mucous in the poop will require a vet visit. This is usually caused by a bacterial infection. Dry skin is a common problem for hedgehogs, especially during the winter. It may also go along with scratching, and particularly bad dry skin can result in large, dandruff-like flakes being shed. The most effective product for dry skin, both as a quick fix and long-term preventative, is Hedgie Soap. Home remedies can also be used as well, most which involve different types of moisturizing oil. To prevent dry skin, several drops of a safe, edible oil (flaxseed, olive, coconut) can be added to the food every day. This can benefit the overall health of the skin, but isn't an effective way to combat dry skin that's already present. As a remedy for existing dry skin, oil can also be dribbled on the back, or added to the rinse water at the end of a bath. A little goes a long way, and too much can potentially lead to other problems, so the bath method works best to distribute a small amount under the quills. With this approach, coconut and vitamin E oil tend to be most effective; others are safe to use but don't work as well, and are more likely to leave greasy residue, funky smell, or even discolor the quills/fur. Another option to help with dry skin is a humidifier near the cage. Oatmeal baths, although commonly recommended, are NOT a solution. Oatmeal can be very soothing, but in cosmetic terms it functions as a protectant, not a moisturizer. Topical sprays designed for cats and dogs are another option. (We use a topical spray called Humilac, with great results.) Most topical sprays have some kind of scent, and some contain ingredients that can cause a skin reaction, so they may not be a great choice for all hedgehogs. Mites are a tiny, almost invisible parasite that can infest a hedgehog's quills and skin. The most obvious sign of mites is excessive quill loss and "bald" patches of skin. This usually accompanied by frequent scratching. The quills that fall out may have yellow/orange gunk at the bottom. Mites can be confirmed by a scrape test done by a vet. This is not always accurate because it it is possible for mites to only be present in some places on the skin, and not others. The treatment for mites is inexpensive, and also harmless even if the hedgehog doesn't have mites, so it's a good idea to treat any mite-like symptoms whether or not the vet can confirm it. Mites should be treated with a topical medicine, either Revolution or Ivermectin. Both of these must be obtained from a vet. The strength used for kittens is appropriate for hedgehogs. One or two drops (depending on the weight of the hedgehog) between the shoulders is the proper dose. DO NOT allow your hedgehog to be given Ivermectin by injection. Ivermectin is given by injection for some animals, such as certain livestock, but this method is dangerous for hedgehogs. There have been multiple cases of hedgehogs dying from being treated with Ivermectin by injection. However, Ivermectin is completely safe when used topically. Mites can come from anything made from wood (including wood shavings or paper-based bedding) or from contact with another animal with mites. Hedgehogs that live on fabric liners, with no wood shavings or wooden houses in their cage, have a very low chance of getting mites. Hedgehogs in the wild hibernate during the winter, but domestic hedgehogs are unable to do so. Low temperatures, drafts, or inadequate light can trigger a hibernation attempt, which can be deadly for your pet. Their bodies are not able to properly function in the "dormant" state that hibernation causes - instead of sleeping for a while and then waking up, like their wild counterparts, their bodies will simply shut down. Signs of a hibernation attempt are lethargy, wobbly/unsteady movement, and unusually low activity level or appetite. If you notice any of these, check your hedgehog's temperature by feeling the stomach. If the stomach is cold to the touch, your hedgehog needs to be warmed up IMMEDIATELY. Warming a hedgehog up should be done gradually. Put the hedgehog on a heating pad (low setting, direct supervision only), in towels that have been warmed in the dryer, or underneath your shirt against your stomach. Do NOT put them in warm/hot water - this can be a shock to their system and they can easily catch a chill when they're wet. Make sure your hedgehog is warm, alert, and active before putting them back in the cage. In the few weeks after a hibernation attempt, hedgehogs may do it again and are also more susceptible to URIs. For this reason, it's a good idea to raise the temperature of the cage by 1-2 degrees after a hibernation attempt. A URI is very easy to treat, although it requires an antibiotic from a vet (usually called Baytril). Although the symptoms resemble those of the "common cold" that humans get, a URI will not go away on its own. If left untreated, a URI can very quickly turn into pneumonia, which is usually severe and difficult to treat in hedgehogs.